Wizz Air has launched a new flight to Budapest from Doncaster Sheffield Airport. The new thrice-weekly service will take off with effect from October 29th and comes hot on the heels of a route to Debrecen being announced just weeks ago. This new route to Budapest will bring a total of five flights per week and almost 100,000 seats to Hungary, making Doncaster Sheffield Airport the best-connected airport to this region from Yorkshire and the north of England. Chris Harcombe, aviation development director, Doncaster Sheffield Airport, said: “Wizz Air is an important strategic partner of Doncaster Sheffield Airport. “Since opening operations in 2006 we have worked together in partnership to develop a growing range of routes with over three million passengers carried. “As one of Europe’s leading low-cost Airlines renowned for low fares and exceptional service we share many of the same values. Budapest is cited as one of the most beautiful cities in Europe, with plenty of elegant, historical structures that reflect its eclectic past such as the Royal Palace, Hungarian State Opera, and Castle Museum. 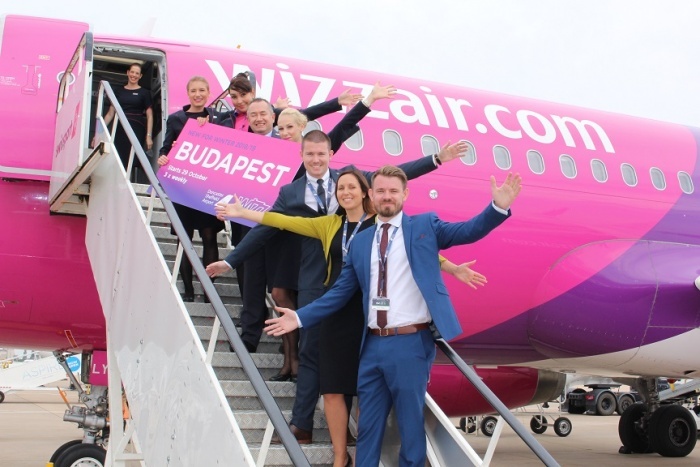 Owain Jones, chief corporate officer at Wizz Air, said: “Wizz is the European airline that is always creating more and more exciting travel connections for our customers across Europe and beyond.